﻿ News Bharati - Institutions under attack in the thick of LokSabha polls..! News Bharati - Institutions under attack in the thick of LokSabha polls..! Institutions under attack in the thick of LokSabha polls..! “History will record that Pt. Jawaharlal Nehru’s great grandson has singularly damaged India’s Parliament as an institution more than anyone else. Attempts are made at 11.00 AM every morning by the Congress Party to disrupt both Houses. The Rajya Sabha once known for the quality of its debates has become non-functional”, slammed FM Arun Jailey on Sunday in a blog post targeting the opposition party uphead the LokSabha polls in India. “The past two months have witnessed several fake campaigns. Each one of them has failed to cut much ice. The ‘compulsive contrarians’ continued to jump from one falsehood to another. The Rafale deal not only strengthens the combat ability of the Indian Air Force but saved thousands of crores for the exchequer. When its falsehood collapsed, a half document was produced to perpetuate the falsehood. Little did the creators of this falsehood realise that the cost of producing half a document is loss of full credibility”, asserted Jaitle claiming that falsehood does not have any longevity. Those who organised loot on the banks between 2008-2014, started alleging that industrial loans had been waived. Not a single rupee was waived. On the contrary, the defaulters have been thrown out of management. The falsehood that the Government and its Ministers were colluding to allow the economic offenders to escape was exposed when one after the other the investigative agencies were succeeding in bringing back many of the key defaulters and middlemen, he added. Stressing at the campaign against the GST regime, Jaitley continued to say that the campaign against the GST fizzled out since in just eighteen months of implementation, it became a consumer friendly measure reducing taxes, exempting small businesses and ending corruption and harassment by eliminating interface of the assesse and the officials. “The attack has now shifted to a new ground. Institutions are under pressure – the charge comes from none others than those who have a history of having subverted institutions all their lives. Illustratively little did the authors of the PMLAs harsh provisions realise that the provisions could haunt the authors themselves. It is, therefore, necessary to analyse this argument of institutions under attack”, he asserted further. 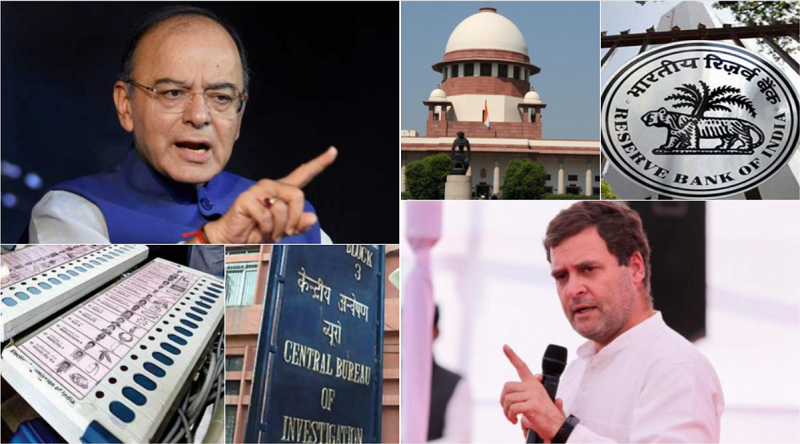 Bringing to notice other government institutions and the campaign headed by the opposition in relation, Arun Jaitley blotted the matters to the notice of the readers to weigh the significance and learn the partial clauses aligned. If we analyse Rahul Gandhi’s two speeches on Rafale, they are based on a personal hatred for the Prime Minister emanating from envy. A failed student always hates the class topper. Additionally, the context of the speeches points more to college-level lumpenisation in content. It has been left to two opposition members namely Bhartruhari Mahtab of the BJD and N.K. Premachandran of the RSP to fill up the intellectual vacuum that the Congress has created. One of the key points being made in regard to the judiciary is that the Government referred back one of the recommendations to the Supreme Court to the collegium for reconsideration. The Government under the present constitutional procedure is entitled to refer back a recommendation of the collegium by recording reasons in writing. If after reconsideration the collegium re-recommends the case, the Government implements the recommendation. This was done in the present case. Regarding delay in implementing the recommendations, the last five years have seen more appointments each year than done in any of the UPA years. The ill-advised press conference of four judges of the Supreme Court last year has more to do with intra-Court affairs than with the Government. On the contrary, what is the track record of the Government’s opponents with regard to their attitude in relation to the judiciary? The impeachment motion filed by the Opposition on unsustainable grounds was only an attempt to intimidate the then Chief Justice of India and set an example for other judges - you toe our line or we can create an embarrassing situation for you. Lawyers opposed to the Government have consistently used intimidation of judges as a court room tactic. Walk out of court hearings, to social media campaigns against the judges was unprecedented but today a reality. Using the instrument of falsehood they have preferred several petitions where facts have actually been found to be false inviting severe strictures from the court. The glaring examples in this regard are the falsehood with regard to Judge Loya’s death, the Rafale issue, the fake voter list scam in Madhya Pradesh and the Vyapam case. In each of the cases, the facts stated were found to be false. Notwithstanding the judgements of the Court, many opposition leaders continue to still rely on the same falsehood. Adverse judgements have led to a campaign against the court. We witnessed a social media campaign against the judgement in the Judge Loya case. After the recent Rafale judgement, one of the petitioners (a former career nationalist) announced that the Supreme Court had lowered its credibility by deciding the Rafale case. There are two critical features of these new emerging breed of ‘institution protectors’. They criticise the Government the maximum and simultaneously argue that the free speech is in danger. They shed crocodile tears for democracy and make every effort to convert the world’s largest democracy into a dynastic one. The number of BJP-RSS workers killed in the Left Front ruled Kerala and the TMC Ruled West Bengal should shock the conscious of a nation. In West Bengal, democracy is seriously under peril. BJP leaders can’t land, public meetings are being prevented and the Rath Yatra was disallowed. The Congress Party’s stand on multiple issues is self-contradictory. It slaughters a cow before the cameras in Kerala, and invokes the National Security Act against the cow killers in Madhya Pradesh. More than any institution it is the country whose interest is paramount. These ‘institution protectors’ support the legitimising of illegal infiltrators into India. They readily jump to the support of those who want to dismember India. The Congress aligned with the Maoist in the recent Chhattisgarh elections. Rahul Gandhi stood shoulder to shoulder with the ‘Tukde Tukde’ gang at the Jawaharlal Nehru University. The Congress was in the forefront of defending the urban naxals in court. And yet it claims to be friend of both, the idea of India and its institutions. It is about time that India and its institutions are protected from these institution wreckers.